Damascus Countryside – A humanitarian aid convoy has been sent to Kanaker town in the southwestern countryside of Damascus. 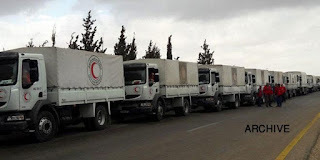 The aid delivery operation was carried out under the supervision of the Syrian Arab Red Crescent (SARC), in cooperation with the International Committee of the Red Cross (ICRC). The five-truck convoy carried food and health supplies and other materials that will be distributed to 2500 persons in the town, reporter said. Last December, security and stability have been restored to the town of Kanaker after a settlement was achieved whereby militants turned themselves in and handed over their arms to authorities in the framework of local reconciliations in the southern side of Damascus Countryside.